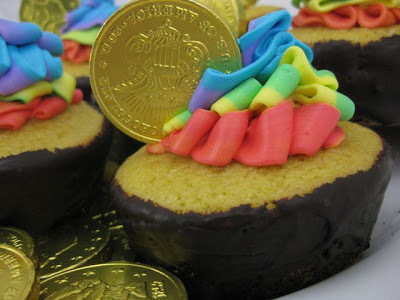 If you can't find actual gold at the end of a rainbow- cupcakes might be the next best thing. 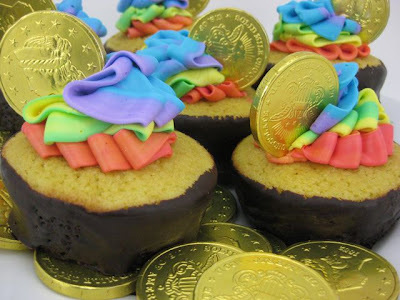 After what was truthfully many, many hours of trial and error I wound up with a plate full of Lucky golden cupcakes for St. Pat's day. 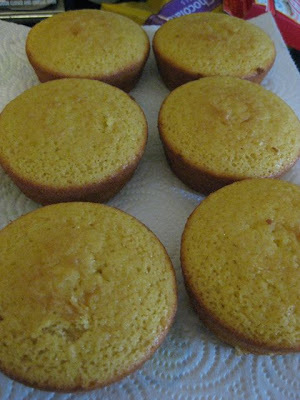 I started with a boxed yellow cake mix. 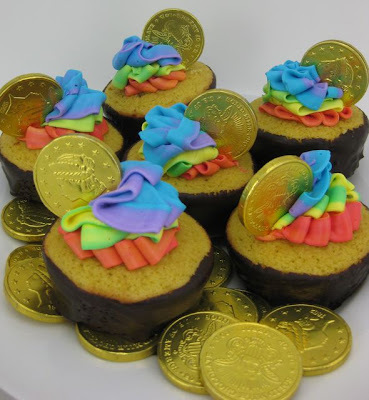 I really wanted to get the idea of a pot with a "gold" cupcake inside. 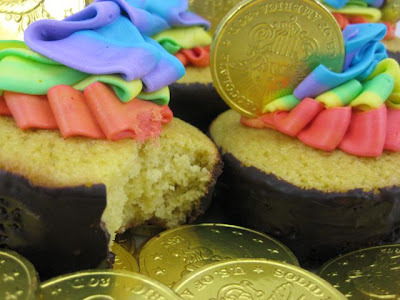 After experimenting with a few methods I found coating the sides of the cupcake worked the best. 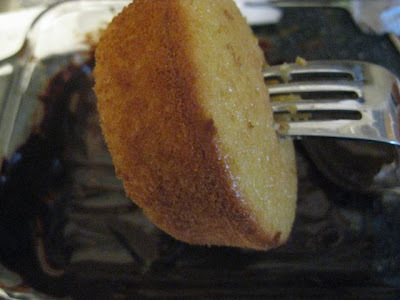 To coat them I stuck a fork into the top of the cupcake (the holes will get covered later by the frosting) and placed my other hand on the bottom, then spun the sides into melted dark chocolate. 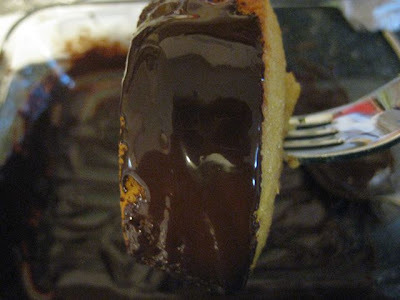 I placed the chocolate covered cakes onto a parchment lined baking sheet and put them into the refrigerator for a few minutes until the chocolate was set. 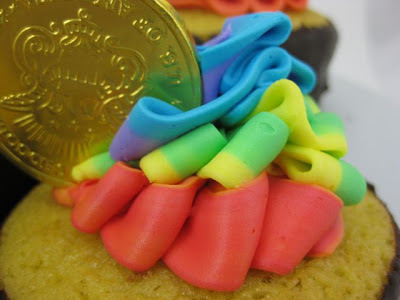 Using food gel I dyed buttercream frosting in rainbow colors. I'm not great at piping but I did a fairly simple technique of putting two colors at a time, side by side into a pastry bag and piped the frosting in three separate layers. 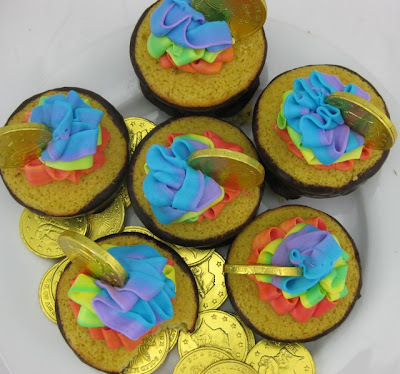 Red and Orange was first, then I switched pastry bags and did a few rounds with yellow/green, finally I topped each one with blue/purple. 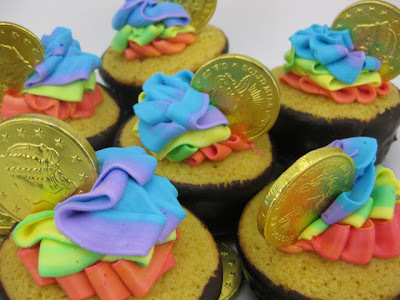 Finally I stuck a chocolate coin into the top of each cupcake. 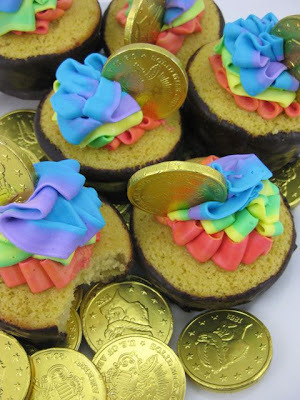 The chocolate coating on the cupcakes tastes so yummy! And I love how colorful they are! Hi Jane- thanks! I just came in under the wire with my St. Pat's crafting this weekend. Seems like times been flying, here I was thinking we were still a week or so away from St. Pat's until my hubby mentioned it was this Wednesday! Thanks Dot and Joanne! Dot I also saw the link round up on dabbled- thanks for that too!